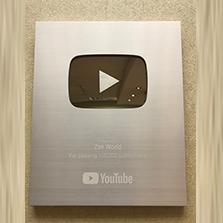 Zee World's YouTube channel has exceeded the milestone 100 000 subscribers, already climbing towards a whopping 150 000 and YouTube has taken note. The channel was awarded with YouTube's official Silver Creator Award which the online giant describes as "something very few YouTube creators accomplish". "Each and every person who has subscribed to your channel has been touched by what you created. They were inspired, challenged or entertained. You achieved this milestone with hard work, perseverance and probably a healthy sense of humour too" says Youtube. Zee World's YouTube content has had almost 25 million views since its inception in February 2015, an incredible achievement no doubt driven by the channel's fresh, relevant and exciting videos uploaded regularly.